In this section you will find some interesting and informative websites/resources that you might find useful. Please inform me if you have any valuable websites that other parents might find useful that I can add. Handwriting builds communication skills for a lifetime. We will be utilizing the Traditional Manuscript. One of the most important things to remember that your child needs to practice to become better! Encourage your child to hold his/her pencil correctly. Click on the link to create your own handwriting worksheets! Just type in the words you want to practice and then print up your personalized worksheets. Keep both feet on the floor. Slant your paper. Paper tilted at the top towards the right. Put both arms on the table. Pull your pencil towards your left elbow. 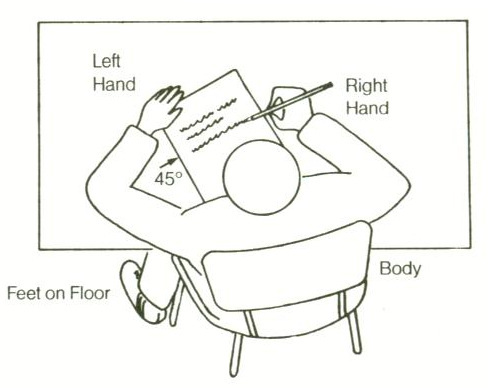 Use your right hand to hold and move your paper. Hold you pencil firmly with your thumb and first finger. Do not squeeze your pencil when you write. Slant your paper. With the top tilted to the left. Pull your pencil towards the middle of your body. Use your left hand to hold and move your paper.